Thanks to a new route on Saudi Airlines from Toronto to Jeddah (JED), Calgary is currently experiencing some crazy price drops to Saudi Arabia via a connection through YYZ. The flights are over 40% cheaper than they've ever been before. The cheap flights from Calgary to Saudi Arabia look to be available between November 2013 and March 2014, on a fairly large variety of date combinations within those months. The flights have 1 stopover each way, in Toronto. Google Flights Explorer is also showing some major price drops between Calgary and other destinations in the Middle East and India, related to this fare drop between Toronto and Jeddah. Destinations such as Dubai, Bahrain, Lebanon, and Jordan in the Middle East, and Chennai, Bangalore, Mumbai, and Hyderabad in India. Google Flights Explorer is showing these destinations as available for $800 to $900 roundtrip after taxes, significantly cheaper than usual, as you can see from the links below. However, so far, I have yet to see these prices to these other destinations as verifying or being bookable. If anyone does find that they are bookable anywhere, please let me know. These other destinations will also likely have lengthy stopovers in Saudi Arabia, which could mean a visa would be required if it's more than 18 hours. UPDATE: It looks like you might be able to click through from Google Flights Explorer to Flight Network to make a booking to *some* of these other destinations. After selecting your flight with Google Flights Explorer, click on the Book button at the bottom left and choose Flight Network. Sandwiched between Egypt, Syria, Iraq, and Yemen, Saudi Arabia is not exactly a typical destination for the average tourist. But if you're into exotic travel or have a specific reason to visit the region, this is definitely a *highly* unusual price that has never happened before. calgary, yyc, flight deals, middle east, persian gulf, jeddah, saudi arabia, jed and saudi airlines. 4 Responses to "Calgary to Saudi Arabia - $771 roundtrip after taxes"
Keep in mind it's really hard to get a Tourist visa for SA. What's going on the photo? 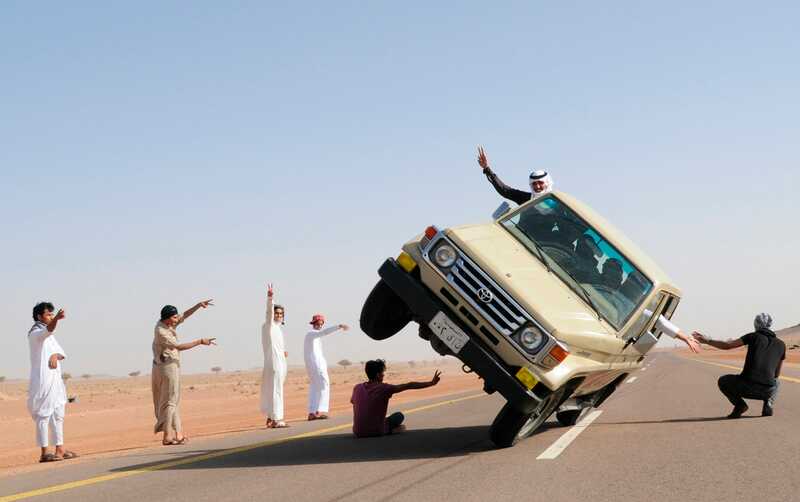 Its a SUV on 2 wheels, most kids and young teenagers do this over in Saudi, its a way to get a cheap thrill, and dangerous! I'm going to pass on Saudi Arabia, as I like my head on my shoulders.